Battambang is a classically quaint provincial capital - old-world architecture and even older pagodas set picturesquely along a river, and even though the city is one of the country's largest, it is still lightly touristed. In town, charming colonial-era buildings line narrow lanes, including the ‘walking district’ near the market where contemporary art galleries, local and foreign cafes, shops and bars inhabit the old shophouses. Battambang is a place to explore the architecture and budding art scene, check out the local cuisine, and to use as a base for excursions into the nearby countryside. Road (291km, National Route #5): The road is paved and in good condition. Bus Several bus companies (including Phnom Penh Sorya, Ponleu Angkor, Rith Mony and Capitol Tours) run multiple daily buses between Phnom Penh to Battambang. First bus departs at 6:30AM and the last at 3:00PM. Fare: 17,000R-20,000R. The trip takes 5 hours. 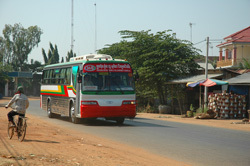 In Battambang, buses depart from the various transportation company offices. See the map. Taxi A private taxi is $45. Shared taxi: 25,000R per person. 4 hours. Prices for shared local transport are very nominal, but are also crowded and uncomfortable. Buy more than one place for the extra leg room. Air There are currently no regularly scheduled flights to Battambang. Boat Daily ferry departs in each direction at 7:00am. $18-$25/person. It's a picturesque, 6-8 hour journey across the Tonle Sap and along the Sangker River in the wet season, but can be considerably longer or cancelled in the dry season due to low water levels. Ask about current conditions. The boats in no way meet international safety standards. 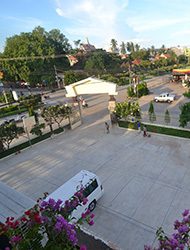 Road (National Routes #6 and #5, via Sisophon): The road from Battambang to Siem Reap around the west side of the lake is in excellent condition. Bus At least four bus companies (including Capitol Tours, Phnom Penh Sorya and Rith Mony) run two or three daily a/c buses, most leaving in the morning. Buy tickets at the bus company office. $4-$5, 2½-3 hours. Taxi A private taxi costs $40-$45 and takes about 3 hours. Brand new hotel on the riverfront road in the center of town. All new amenities including A/C, nice wooden furniture (including writing desk), flat screen cable TV, fridge, en suite bath with hot water and more. Corner of Street 1 and Street 127, Battambang City, Cambodia. Clean, basic, very affordable A/C rooms with free wifi, mini-fridge, en suite bathroom with hot/cold shower. Restaurant, laundry, tourist services, just ask. Located opposite Wat Tahm Rai Saw. Easy walking distance to the Museum and the Walking District. Corner of Street #3 and Street #127, Battambang City, Cambodia. Fully outfitted and equipped hotel/resort complex sporting well-appointed, traditionally inspired rooms. All rooms with a/c, CTV, DVD, stocked mini-bar, wifi, en suite bathroom with hot/ water. 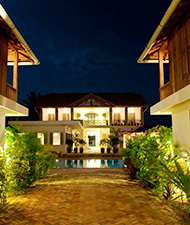 Swimming pool and full restaurant and bar serving Cambodian and international fare. Quiet area only 2 minutes from town center. Street 203,east side of the river, Battambang City, Cambodia. Lovely garden setting in a peaceful area just south of town. Well-appointed rooms, bungalows and large family bungalows with A/C, mini-bar, free wifi, furnished including desk, en suite bathrooms with hot water, some with sun showers. Large saltwater pool. Good restaurant with full bar and breezy loft seating with a sunset view. 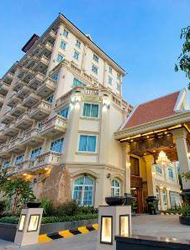 Upmarket hotel featuring Khmer-inspired design and décor, and offering rooms and suites suitable for the leisure, business or family traveler. Well-appointed rooms and suites with luxurious wooden furniture, all modern amenities and many rooms with private balconies. Hotel facilities include fitness center with all new exercise equipment, full spa and massage services, international restaurant and banquet facilities and a large saltwater swimming pool with poolside bar. Free wifi in the rooms and throughout the hotel. 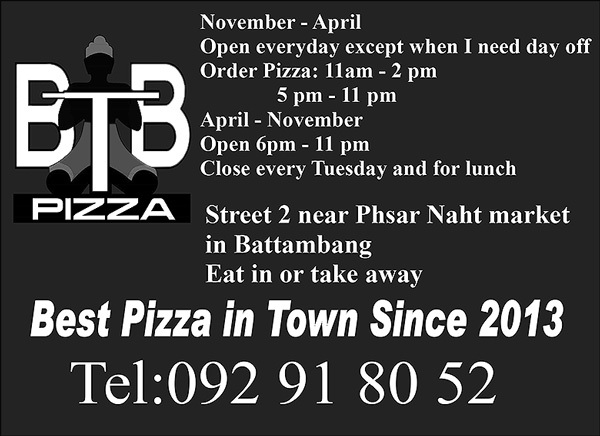 Street 159D and street 207, Phum Romchek 4, Sangkat Ratanak, Battambang City, Cambodia. 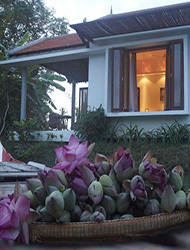 Villa style guesthouse a couple of hundred meters off the main road in a quiet area. Large rooms with the standard amenities: A/C, CTV, en suite with hot water. Very affordable. Long term rates available. Loft restaurant, full bar. Street 300, east of the river, , Battambang City, Cambodia. New in-town multi-storey hotel offering spacious, well-outfitted rooms, many with private balconies and impressive cityscape views. A/C, CTV, free wifi, fridge, en suite bathroom with hot cold water. Value priced. Street 207, east of the river, Battambang City, Cambodia. On street 1.5 and 2 about 150m south of Phsar Nath (​​​​Center market), Battambang City, Cambodia. 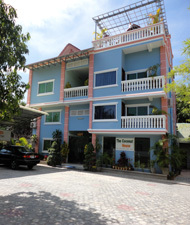 Friendly, sociable backpacker hostel with dorm beds and private rooms. Lush garden with hammocks, shady bungalows and a ping pong table. Roof terrace for films or live sports, playing wii, or relaxing as the sun sets over the river. 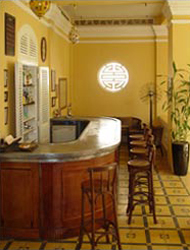 The bar/restaurant has an extensive and good value food and drink menu. Tours, tickets, travel advice. Multi-storey town center hotel offering nicely furnished air-conditioned rooms with cable TV, fridge, wifi, IDD, bathroom with hot/cold water. 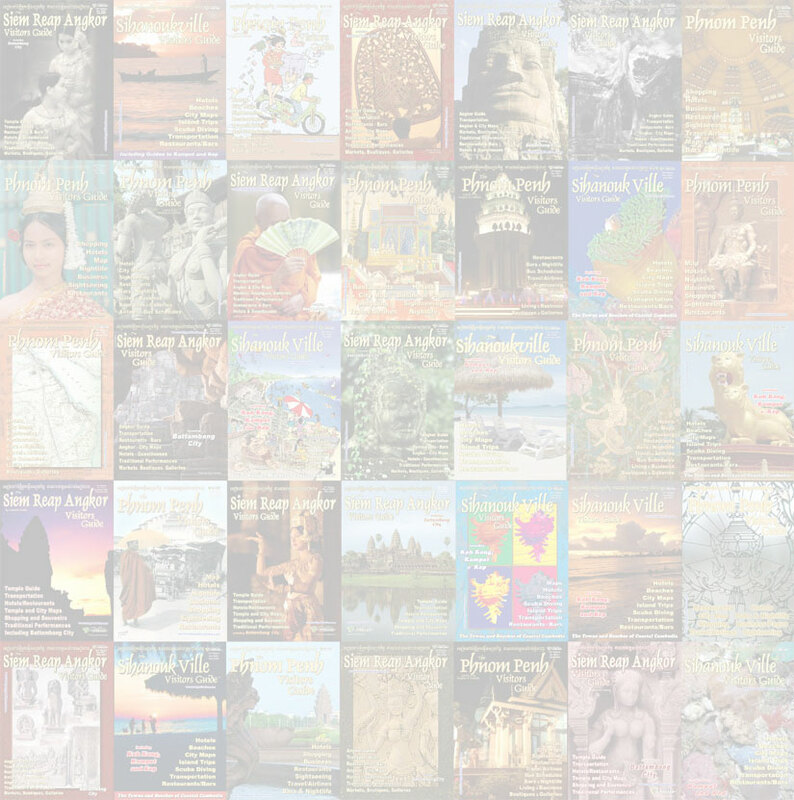 #695, St. 106, Village Preak Mohatep, Khum Svay Por, Battambang City, Cambodia. 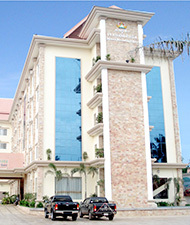 Well-appointed A/C rooms and suites with all amenities: CTV (flat screen), fridge, IDD, free wifi, hot water. Swimming pool, restaurant, gym, spa, massage, karaoke club. Overlooking a nice little park near the entrance to town. Reasonably priced a/c and fan rooms with attached bathroom, cable TV, hot water and fridge. Free pick up and internet. 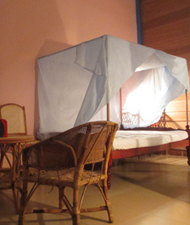 Clean, budget-friendly fan and a/c rooms in Battambang. Fan rooms from only $6. All rooms with cable TV, fridge, in-room wifi and en suite bathroom with hot and cold water. Some rooms with other amenities including hair dryer, coffee maker, etc. 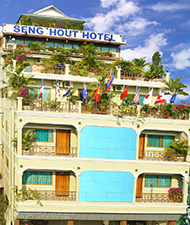 Hotel restaurant serving Khmer and western food and other tourist services including laundry service. On Street 403, Phum Ang, Sangkat Ochar, Battambang City, Cambodia. Seven rooms including one suite in a beautiful colonial house with a swimming pool and a beautiful garden. The hotel is near the river in a countryside setting on the east side of the river, a five minute walk from the city center. Swiss management. English, French, German, Italian and Spanish spoken. Homemade bread. Espresso. WiFi. Western Food. Swiss Specialties. 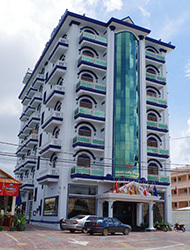 200 Street, Phum Rumchek4, Battambang City, Cambodia. In town near Phsar Nath (the main market.) Nicely furnished a/c rooms with CTV, fridge, free wifi and en suite bathroom with hot water. Rooftop cafe with a 360 view of the town. Good value for money. Street 2, north of the market, Battambang City, Cambodia. A/c and fan rooms with all amenities including IDD and Internet port. En suite bathroom. Conference room. Elevator. Free pick-up and internet. Boat, bus tickets available. Street 211, east of the river, Battambang City, Cambodia. 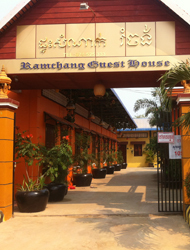 One of Battambang’s better hotels. 130 nicely appointed rooms and suites. 10-minute stroll to the Walking District. Large, well-appointed rooms. Free wifi. Swimming pool and gym. All in all a very good value. Good restaurant. Street 2, near National Route Nº5, Battambang City, Cambodia. Unique hotel, in town on the riverside on the east side of the river. 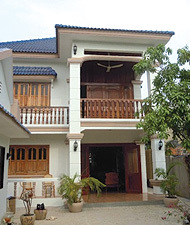 Rooms, suites and villas with a/c, CTV, in-.room wifi, fridge, en suite bathroom with hot water. Family rooms available. In-room wifi. Swimming pool. Massage. Battambang’s dining and drinking scene is modest but growing, with some unique offerings and a good variety, including several little cafes and bars in the Walking District, a few bakeries and coffeeshops around town, a good choice of local places and some very good guesthouse restaurants. These days the town even has its own rather hopefully named ‘Pub Street,’ sporting mostly local restaurants offering reasonably priced Cambodian and Southeast Asian fare. The picturesque Walking District is of special note. The area harbors more than a dozen small restaurants and bars as well as a few shops and galleries in classic old colonial era buildings. Especially along ‘Pub Street’ (Street 121) and on and near Street 2.5 where there are several restaurants, artsy little cafes, shops and bars, a couple staying open late. To try some local street food check out the Street 2 path through the market (Phsar Nath) and the riverfront park near the Provincial Museum where a couple of dozen soup, sandwiches and dessert places set up in the afternoons and evenings. 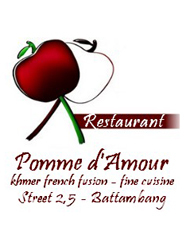 At the Apple of Love Patrice cooks Khmer cuisine with a French twist. Slightly upscale but cozy, welcoming atmosphere. Walking District, Street 2.5, Battambang City, Cambodia. The restaurant/bar at the Bambu Hotel offers some of the better dining in town - primarily western favorites and some local choices. 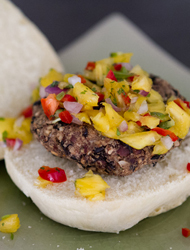 BBQ Lamb Chops, imported steak, baked grouper and more. Free wifi. Street 203, east side of river, Battambang City, Cambodia. Tucked amongst the shops of busy Street 2 in the Walking District, this little pizza place serves up a selection of tasty and unique pizzas including the Luc-Lak Pizza. A choice of several different wines, including a couple by the glass, full bar, and changing dessert offerings. Check the board. Walking District, between Street 2, Battambang City, Cambodia. Friendly cafe serving up mostly Western fare, with American-sized portions and American-style service. Breakfasts including huevos rancheros or the homemade cinnamon apple pancakes. Happy hour: 3pm until 7pm. Street 1, riverfront, north of the market, Battambang City, Cambodia. Tasty western and Khmer foods served indoors or curbside at this plesant little guesthouse restaurant. Relaxing atmosphere. Sunday BBQ. Reasonable prices. Happy Day draft $0.75. Free pool table and wifi. Cocktails, friendly service. Two ECRAN movie rooms. Walking District, Street 1.5, Battambang City, Cambodia. Large A/C restaurant and bakery located on the New Bridge Road. Offering a nice selection of western, American and Mexican breakfasts and lunches - Granola, eggs and potatoes, biscuits and sausage gravy, burgers, meatloaf, pizzas, burritos, tacos and more. A few Khmer dishes as well. Fresh baked cakes, cookies, brownies, pies, breads. Wifi. Delivery. Street 300, east side of river, Battambang City, Cambodia. Breezy loft restaurant at the Coconut House guesthouse. Big selection of homemade Khmer and western dishes prepared using a “healthy plate” concept and only olive and best quality frying oils. Selected fresh vegetables, fruits and meats. Catering. Lunch boxes. Cooking classes. Price range from 2.5$-6$ per meal. Cheap beer and cocktails, and a wide range of Khmer and Western food, including homemade sausages and burgers, a traditional steamed fish amok and Full English Breakfast. Eat and drink swinging in a hammock in the garden, or sitting with friends round a pub table under a canopy of flowers. Open late. Weekly pub quiz and barbecues. Street 159D, near Wat Sangker, Battambang City, Cambodia. Popular, NGO based, contemporary restaurant serving excellent Cambodian cuisine, a very nice tapas, and a selection of cocktails. Comfortable, air-conditioned dining and unique curbside platform seating. Walking District, Street 2, corner of the Street 1.5 turnoff, Battambang City, Cambodia. Friendly, long-running cafe and restaurant in the Walking District, with comfortable curbside and indoor seating, serving a good selection of Khmer and international dishes including a very good lasagna and Khmer Pizza. Good service. Full bar. Free wifi. Walking Disrtict, between Streets 2 and 2.5, Battambang City, Cambodia. Cozy corner shop cafe and bar on the quiet Street 1.5. 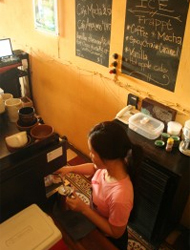 Breakfasts, sandwiches, good coffees, teas, juices. Check the board. Free wifi. Relaxed atmosphere. Nice little work space. Contact for Soksabike bicycle tours. Some of the finest western dining in town. 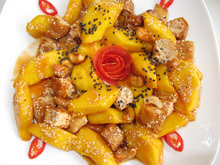 Excellent western and Asian food and a wide range of cocktails served in an a/c restaurant or the garden patio of a beautifully restored 1930s colonial villa. Wine selection. Western managed. Closed Tuesdays. Street 159D, (river road, east side), Battambang City, Cambodia. Contemporary art space upstairs, bar and cafe downstairs, with comfortable curbside and bar seating, full bar, choice of international and Khmer dishes including some nice tapas. Hosting films, performance and artistic events. 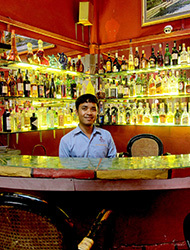 Full bar: draft beer, cocktail, home-made rum and a large variety of ice creams and local snacks. Excellent crepes. Popular bar, especially in the evening, often one of the last places in town to close. Walking District, Corner Street 2.5/Pub St (Street 121), Battambang City, Cambodia. Battambang's Nary Kitchen is a family-run restaurant that serves inexpensive, delicious Khmer food. The simple menu is filled with classics like lok lak and Cambodian stir-fries, all of them priced at $3 or less. The staff get ingredients fresh from the market every day and there are many options for vegetarians. Street 111, near Phsar Nath, Battambang City, Cambodia. Inexpensive local restaurant near the White Rose. Very good fresh made noodles. Lots of Chinese dishes. Great place for a Cambodian noodle soup (kuiteo) or fried meat with rice breakfast. Try the duck soup. Recommended. Walking District, Pub Street (Street 121), Battambang City, Cambodia. Unique, riverside bar and restaurant, open-air and under the trees and stars. Comfortable table seating and a proper bar and bar seating. 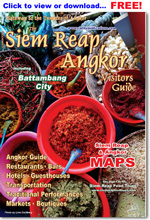 Big selection of Cambodian snack and meals as well as a few western choices. Full bar with cocktails, draft beer and wine. Located riverside near the Old Stone Bridge, Battambang City, Cambodia. Well-known and long-established, this corner-shop Cambodian restaurant offers an extensive menu, pretty good Cambodian food, ice cream, reasonable prices. Street 2 near several other restaurants. Another good place to for Cambodian breakfast. 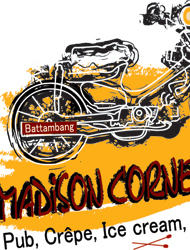 Walking District, Corner Street 2/Pub Street (Street 121), Battambang City, Cambodia. 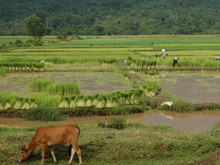 Battambang City is full of wonderful colonial-era architecture and historic old pagodas, and the surrounding countryside harbors not only Angkorian-era ruins and historic pagodas but also offers some of the most picturesque rice paddy and village scenery in the country. The bamboo train is a unique and creative form of ad-hoc transportation. It consists of a small motorcycle engine-powered bamboo cart that rides the railroad tracks, picking up and dropping off passengers, cargo and animals along the way. When it meets bamboo train, it can be disassembled and taken off the rails in a minute or two, allowing the other to pass. The bamboo train near the city seems to be catering as much to tourists as locals these days, but is still the real deal. 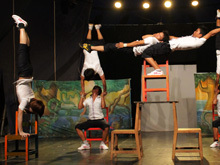 They now charge foreigner upwards of $5/pax. 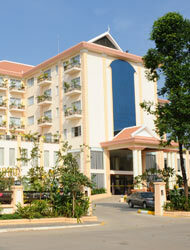 Located on Route #5 about 1km west of town, Battambang City, Cambodia. Located just west of Phsar Nath. 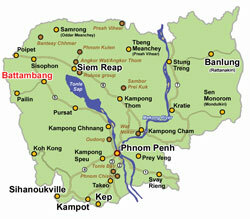 See map for exact location, Battambang City, Cambodia. The Smokin' Pot restaurant near the White Rose restaurant at the corner of Street 1 in the center of town also offers cooking classes. Phnom Banan Phnom Banan is a mountaintop, mid-11th century Angkorian-era ruin consisting of five prasats (towers) arranged in the quincunx (five-pointed) form reminiscent of Angkor Wat. 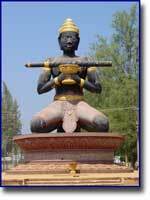 The temple was built by the Khmer ruler Udayadityavarman II, son of Suryavarman I, the king who built the temple at Ek Phnom. Several lintel carvings are in good condition. The mountaintop is a peaceful location with a sweeping view of the surrounding area. There is a small cave nearby known as L’Ang But Meas. A very old (150 years+) active pagoda at the base of the mountain. As both are south of Battambang City, the trip to Phnom Banan is often combined with a stop at Phnom Sampeou, Battambang City, Cambodia. Phnom Sampeou is a mountain steeped in legend, topped by Wat Sampeou and a group of caves used as 'killing caves' by the Khmer Rouge, containing the skeletal remains of their victims. The wat is unexceptional but the view is spectacular. 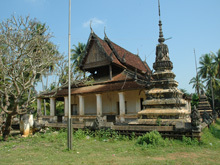 The whole area in intertwined with the well-known Khmer folk legend of Neang Rumsay Sok, 'the girl who let down her hair.' 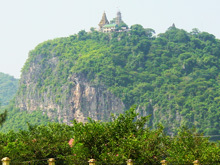 Many of the local geographic features are named after aspects of the legend, including Phnom Sampeou (Boat Mountain.) Ask your guide or driver to tell you the legend. 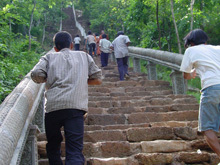 For sake of ease, take the winding path up the mountain rather than the stairs, which make for a formidable climb. In the evening around 6:00PM two of the caves disgorge millions of bats which pour into the dusk sky for more than 30 minutes, making quite an impressive site. Not to be missed if you happen to be at Phnom Sampeou in the evening. 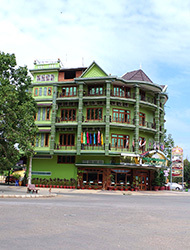 Battambang Resort offers a unique snack tour between town and Wat Kor Village. A short cycling tour (also possible by tuk tuk) brings you to different kind of food stalls where you can try all kinds of Cambodian snacks. 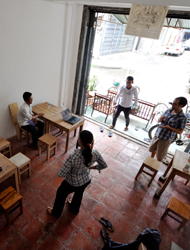 Battambang shopping has taken an artsier air in recent years. Traditionally, Battambang has been a place to buy marble and wood carvings, new cut gems from Pailin, and Cambodia’s famous Pursat oranges. And it still is, but over the past few years a contemporary art scene has begun to blossom in Battambang, and several art galleries along with it. Art spaces and unique shopping venues inhabit some of the old colonial-era shophouses of the picturesque Walking District, especially along Street 2.5 and the surrounding area. 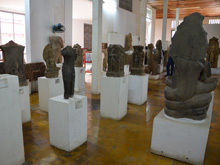 Highlights include the Lotus Gallery & Bar and Make Maek, both hosting exhibitions and events, and The Lost Stick, offering an amazing collection of curios and art from Cambodia and beyond. For more traditional Battambang souvenirs, riverfront shops along Street 1 offer marble and wood carvings and statues and other souvenirs. Amongst Battambang City’s three traditional markets, Phsar Nath in the center of town is the primary market. Its distinctive clock tower on the river side is a local landmark. The market is geared to the locals, vending fruits, vegetables, meat, clothes, sundries, etc. 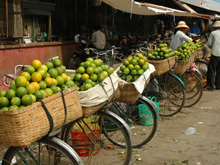 Phsar Leu, just south of town, is the place to buy local fruits: oranges and pomelos from Pursat. The oranges are said to be the best in the country. All banks encash travelers checks and change money and most have ATMs. There are several ATMs at the riverfront street corner in front of Phsar Nath. Moneychangers are concentrated around the market with a few along Road #1. Kamakar Village, Sangkat Svay Por, Battambang Municipality, Battambang Province, Cambodia. Currency exchange, t/c exchange, Western Union services. #72, Street 3, Battambang Province, Cambodia. Currency exchange, ATM, t/c exchange, Western Union services. Visa/MC/Maestro/Cirrus/Diners Club International/Riels. #118, Street 2, Battambang Province, Cambodia. Currency exchange, ATM, t/c exchange, ‘No commission’ Visa card cash advance. No. 100E0, Group 9, Prek Moha Tep village, Sangkat Svay Por, Battambang Town, Battambang Province, Cambodia. Dentistry: Implant, Oral Surgery, Orthodontics, Pediatric, Preventive, Endodontic & Restorative, General Consultation and Diagnosis, Aesthetics and Whitening, Prosthondontics, Dr. Ly Sokseyha. 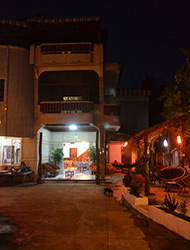 #212-213, (Next to Sorya Bus Station and Opposite Hang Lay Guesthouse) North of Boeung Chhoeuk Market, Battambang Province, Cambodia.